“Don’t you Forget about Me”. That’s the title of the song that opens this quintessential 1985 teen movie, directed by John Hughes and featuring the hottest young stars of the 1980’s, infamously known as the “Brat Pack”. 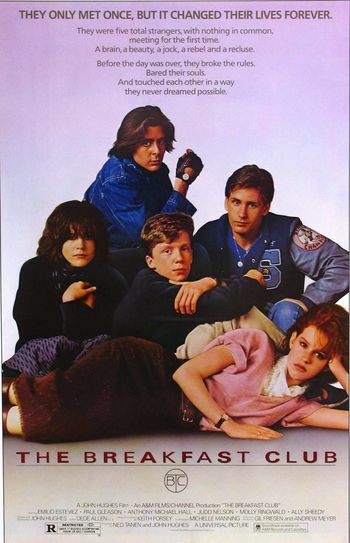 “The Breakfast Club” portrays a group of students “…trapped in a day-long Saturday detention in a prison-like school library…Claire, the princess (Molly Ringwald); Andrew, the jock (Emilio Estevez); John, the criminal (Judd Nelson); Brian, the brain (Anthony Michael Hall); and Allison, the basket case (Ally Sheedy).” The punishment consists of writing a thousand word essay describing who they perceive themselves to be. Ensues nine hours of teenage drama. (I don’t say that pejoratively). Hughes’ vision of the various stereotypes is without doubt spot on. The conversation, the food, the clothes, everything is highlighted to fit each stereotype. Oh and the music, that just makes the picture complete. The cast vividly brings these characters to life in memorable performances. I personally have a soft spot for Sheedy’s “basket case”. All in all, the movie adequately addresses the troubles of its characters and the underlying issues brought up, in as much as it doesn’t aim to proffer solutions to those problems. But I want to think that wasn’t the purpose behind this endeavor. There have been and will be many of such. But “The Breakfast Club” isn’t one of them. What I see in this movie, is a timeless outcry against society’s boundaries. The unified parting note that “The Brain” leaves for Vernon at the end of the movie, signed “The Breakfast Club”, is indicative of these societal limitations. It also hints at the possibility for such limitations to be overcome.